With President Donald Trump reportedly* pulling the United States out of the Paris climate accord, heads must be exploding in California’s Democratic supermajority State Capitol. However, Trump’s decision fulfills a very important campaign promise he made to “cancel” the accord. California Gov. Jerry Brown issued an Executive Order in 2015 for a drastic new target for greenhouse gas emissions cuts, coinciding with the international Paris Climate Change Treaty. Brown said it was critical to address what he called “an ever-growing threat” posed by global warming to California’s economy and well-being. Brown’s order went even further than then-President Obama’s radical proposals, but aligned with the European Union and United Nations proposals. Brown the lover-of-all-things-enviro, issued the stricter greenhouse gas reduction target for the state of 40 percent below 1990 levels by 2030. Because apparently already achieving 1990 levels of greenhouse gas levels by 2020 (AB 32) was just too easy, thanks to automotive technology and an abundance of clean natural gas. Axios reported that EPA Administrator Scott Pruitt will work on the withdrawal along with a small team, which will have to decide on whether to initiate a full withdrawal, and/or exit the underlying United Nations climate change treaty. “It also makes the U.S. an outlier among the world’s nations, nearly all of whom support the climate change accord,” The Hill wrote. Given America’s contributions to science, culture and economics, the rest of the world are the outliers. Trump’s decision to pull out of Paris is the greatest way to unravel Obama’s climate legacy. C’est si bon! And, this is one way to start to put California’s go-it-alone business-killing global warming regulations to an end. Gov. Brown’s 2017-18 Budget priorities are climate change policy and spending, and the green economy, including another $2.2 Billion for the faltering cap and trade program, of which Brown promised to increase efforts to prop up. California’s go-it-alone venture into regional carbon markets has been a disaster, despite the grandiose promises otherwise. The last 2016 auction of carbon credits brought in an embarrassing 2 percent of the revenues promised. Future auctions are also expected to fall short, largely because the creators of this false commodity don’t understand economics or the free market: there is a glut of carbon credit allowances, as well as legality issues plaguing the cap and trade scheme. Also, in May 2016, Gov. Brown signed a climate change compact (an illegal treaty) between 12 regional and provincial governments in seven countries, committing to reduce greenhouse gases which they claim cause global warming. Brown’s motive was to demonstrate California’s commitment to the rest of the country and world. Prior to that illegal compact, in 2015 I reported on the collusion between the California, Washington and Oregon governors’ offices, British Columbia and environmental groups, in the form of an illegal compact to force climate policy coordination and collaboration across the U.S. “In October 2013, California Gov. Jerry Brown, together with the Governors of Oregon and Washington and the British Columbia Premier, signed the Pacific Coast Action Plan on Climate and Energy, “to align climate change policies and promote clean energy.” The Pacific Coast Collaborative links with the West Coast Infrastructure Exchange (WCX), a compact between California, Oregon, Washington and British Columbia, formed in 2013 to promote “the type of new thinking necessary to solve the West Coast’s infrastructure crisis.” And the WCX is linked to the Clinton Foundation’s Clinton Global Initiative. In November, following the presidential election, Gov. Brown said, “We will protect the precious rights of our people and continue to confront the existential threat of our time—devastating climate change.” This is Brown’s evangelism, despite how arbitrary, inconsistent and destructive environmental regulations have become, and how out of touch the lawmakers are who vote for them. Those who refuse to acknowledge that CO2, a colorless, odorless gas, is not a pollutant, and is however, an essential plant nutrient, are prevaricators, and also deny climate change has been occurring for more than 4 billion years. Today’s “Climate Change” crusade is about money; many world leaders are on record admitting it is about wealth redistribution. Nowhere in the Paris Climate Accord agreement are the words “CO2” and “carbon dioxide” defined. Instead they use “emissions” and “carbon” (not “carbon dioxide”), which allows for easily manipulated rules. With the U.S. pulling out, the Paris Climate Accord will become meaningless. Europe doesn’t have the money to pay for it. And eventually, it just won’t matter who stays in. We Never Had Paris: C’est Si Bon! 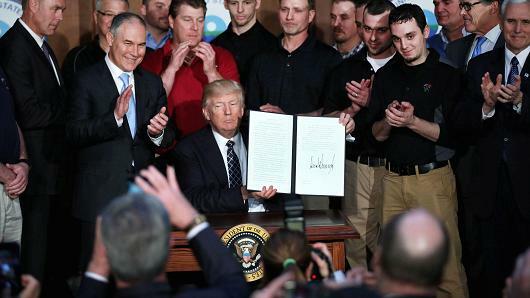 *UPDATE June 1, 2017: No longer is President Trump “reportedly” pulling out of the Paris Climate Change Treaty. It is done. This entry was posted on Wednesday, May 31st, 2017 at 1:41 pm and is filed under Blog Posts.